Disclosure: This article contains affiliate links of products I have used and recommended. Wow! Who knows how accurate were these claims, but it turned out these would just be a couple of the benefits of Longjing green tea we’d be introduced to when we went to visit a tea plantation just outside of Hangzhou. Another one, for example, is that it can lower cholesterol levels. I have heard that claim a lot about green tea, plus my dad (a physician) said the medical literature has backed that up for the last couple decades, so it probably has validity. A tea plantation representative gave an interesting demonstration involving iodine, rice and water. She mixed the three together, and the water turned a dark color. However, when she poured Longjing tea into this mixture, it turned clear again. Impressive, but what exactly was the point? According to my dad, it was to show how good of an antioxidant Longjing tea was. Iodine, supposedly, is a high oxidant and therefore not desirable. (Never mind that it is such an essential nutrient that it is added to salt?) So by turning the darkened rice and water back to clear, it “proves” that Longjing tea reverses the oxidation effects? Something like that. The last claim was that Longjing tea helps ward off mosquitos. Health claims aside, the tea was tasty and the simplification-loving side of me kind of liked how the Chinese drink this tea by just putting leaves in a cup (without a strainer or tea bag), pour water in it, and voilá. (This is demonstrated at 0:50 in the trailer for the movie, Shanghai Calling.) Plus, I thought a can of this would make a good gift for friends. So, I inquired how much a can would cost. “We don’t sell the cans, only packages,” replied the representative. One package was about the size of a typical bag of flour from an American supermarket. The cost per package? Oh, just 1200 RMB (about US$192 at today’s exchange rates). Then, as almost on cue, I looked down at my arms and I had three new mosquito bites already. 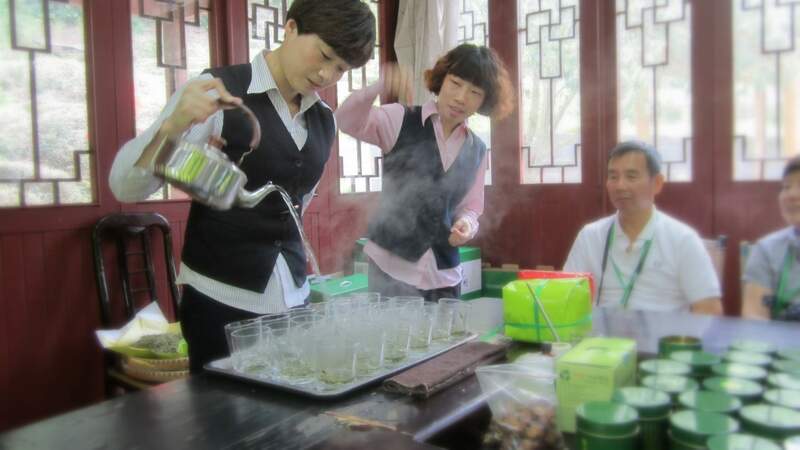 This despite having a cup of Longjing tea about three inches in front of them, and being a mere two feet behind packages and packages of Longjing tea placed on the table. I guess “mosquito repelling” is one claim we can handily dismiss, then. I did not buy the tea. But my cholesterol levels are already super low, I am not diabetic, my skin is smooth, and I already have a whole shelf full of various teas, thank you.